In 1959 Alejandro De Tomaso established De Tomaso Automobili at Modena, concerned with the construction of racing cars. Having been born and brought up in Argentina, he had left (supposedly for political reasons), married an American lady and moved to Italy. The racing cars used his own chassis and were powered first by OSCA engines and then Ford units. Road cars came later, starting with the mid-engined Vallelunga (powered by a 1.5-litre Cortina engine) in 1963, then the Mangusta, and then the classic Pantera. At a similar time the Deauville saloon and Longchamp 2+2 coupe were developed. All the cars used big Ford V8 engines and had bodies designed and built by Ghia, a coachbuilder purchased by De Tomaso (jointly with Ford) in 1967. Vignale was also acquired and used for production, as was a later relationship with Maggiora. The Pantera got off to a good start with the blessing (and marketing) of Ford, a deal which, for the few years it lasted, saw high sales. 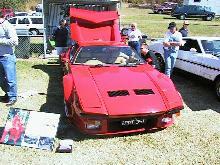 After the oil crisis and the poor quality of the cars scuppered the deal with Ford, De Tomaso returned to the realms of low volume manufacturers where they continued until 1991 with a revised Pantera before introducing a new model, the Guara. Outside investment saw the Bigua shown in 1996, but the relationship turned sour and the resulting company, Qvale, split off. Rumours persist about a new Pantera.